Here are all of the quests with Mr and Mrs Hill’s ghosts. You Can Be a Ghost! Watch where you are riding lunatic! You aren’t the only person up here, you know! Ghost?! YOU could be a ghost! You almost run me over like a mad-woman then accuse me of being a ghost? All I’m doing here is waiting here, minding my own business, waiting for my wife to come home. Get out of here! Ghost… Hah! Objectives: Speak with someone at Moorland Stables about the ghost in Nilmer’s Highland. Maybe Tan would know something about this? A ghost? Ha ha, you didn’t think I’d fall for that, did you Rita? Whoa… You aren’t joking? Okay. I’m not entirely convinced it was a ghost you saw… Maybe you ate something funny… Or didn’t get enough sleep? Did you watch too many scary movies lately? The only thing I know is that the farm up there has been abandoned for many years. Go and ask Loretta about it… I think she knows more about that farm. Maybe Loretta will be more helpful. Ghost? You saw it too? Anyways, Mrs Holdsworth is old enough that she probably remembers something from that time. She must know more than I do. Maybe you should ask her? Objectives: Speak with Mrs Holdsworth. Mrs Holdsworth knows about a lot of things. Like I said, it was a tragic accident. During a competition, the old bridge collapsed! I remember it like it was yesterday. All of Jorvik was in shock when it happened. What made you ask me about it? It was a very long time ago. You want to know about the people who died? All I know is that it was a handsome man with a handsome horse. The papers wrote a lot about the accident. I’m sure there are some old copies of the Jorvik Gazette in the library archives. That’s where I would look if I were you. Good luck my friend! Objectives: Ride to the library at the Winery and try to find more information about the accident. One more trip to the library. Pick up the newspaper on top of the bookshelf, inside the library. A competitor was killed in a tragic accident during the weekend’s competition in Moorland when the bridge over the southern part of the river collapsed. It appears that the wooden structure of the bridge had begun to rot and that lead to the collapse. The man who died has been identified as Mr Hill. Mr Hill leaves behind a wife who is grief stricken after the accident. The council in Silverglade is investigating the accident, the people responsible for the competition, and will speak to the wife of the victim. A report on the incident will be delivered soon. Objectives: Speak with the Council Man in Silverglade Village. Let’s go see if the Council Man knows anything. An accident in Nilmer’s Highland? It must have been before I started working here. But of course I’ll help you try to find out more about it. I went down into the archives and dug around a bit. I found the report on the accident. It turns out the bridge wasn’t built up to proper standards at all! G.E.D., the company who built the bridge, used old wood and substandard concrete to save money. It was a long time ago, and now G.E.D. is viewed as a respectable company… At least they seem to think so. His wife, Mrs Hill, moved to Firgrove after the accident, according to the report.If you want to know more about her, you should speak to my colleague, the council man in Firgrove. Objectives: Speak with the council man in Firgrove Village. Ride to Firgrove and speak with Mr Franklin. Maybe he knows more. Mrs Hill? Yes, she lived here. I’m sorry to say it but she died many years ago. Was she a relative of yours? Aha, not a relative then. Unfortunately, Mrs Hill has been dead for a long time now and her house has been torn down. So I’m not really sure what I can do to help you. I remember her quite well. She was an excellent dressage rider. It was always a bit sad to see her as she was heartbroken and never really recovered from her husband’s accident. The only time she really perked up was wen she would ride the competition track outside the village. She said it reminded her of her lost love. I’ve heard the other villagers here say that they have seen her up there, along the track outside the village, after she died… But I don’t really believe it. You can ride around up there and have a look for yourself but I wouldn’t expect anything. Objectives: Look for Mrs Hill outside Firgrove Village along the riding trail. Mrs Hill can be found along the hard forest track. Go down to where Minka is, then follow the trail up onto the bridge with the two breaks in it. Mrs Hill is standing at the end of the bridge (or follow the trail in reverse, and she’s off the trail before the bridge). Ooooo… My looove… Where are youuuuu? Oooo… My husband… Where are you… I need to find you… Ooooo…. Objectives: Speak with the ghost in Nilmer’s Highland. Ride back to Nilmer’s Highland and speak with Mr Hill’s ghost. 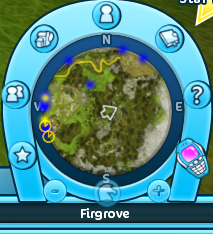 My wife is in Firgrove? Balderdash! 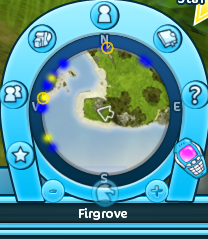 My wife lives in Firgrove? What are you talking about? She lives here with me. If you don’t believe me, go in and look in my attic for yourself. All her pictures, books, and other things are up there like they always have been. Objectives: Look in the house for anything that might convince Mr Hill that his wife doesn’t live there anymore. Dismount your horse to go into the attic. Search through the boxes there, then return to Mr Hill when you have found something. My goodness… That is my wife’s wedding ring! She never takes that off… What is going on? How can her ring be here? She never, ever takes it off… I don’t understand… Is someone playing a joke on me? It doesn’t really matter, she needs to get her ring back. My poor wife, she must be really upset. Take the ring… Find her for me please. I will be eternally in your debt. Objectives: Take the rings to Mrs Hill. Ride back to Firgrove, where you found Mrs Hill, and show her the rings. Oooo… Booo… Where is my love… Whaa? That is my ring. And my husband’s! Where did you find them? Who are you? Return to Mrs Hill tomorrow. Ride to Firgrove and show Mrs Hill the wedding rings you found. You found our rings. It feels like waking up from a dream. Look at me… I am no longer flesh and blood… I am transparent! I’m ready to accept that I am dead… I have to be. I am a ghost. What was that? You know where my husband is? He doesn’t know the fate he met a long time ago on that horrible day? I need to go see him. It is the only thing that will give me peace and I’m sure it is the same for him. I know what we should do. Take our rings and place them on my husband’s grave… Or as I should really say OUR grave… Which I remember now. You should be able to find it. The grave lies a little south of an apple grove, by a little cape where you can see Fort Pinta on the other side of the water. The grave is in the shade of a big old tree. Objectives: Put the rings on the grave. Our grave lies to the south of the apple grove, by a little hill where you can see Fort Pinta and the official castle on the other side of the castle. Ride along the Fire Trail, past Applegrove. There will be a large hill between the road and the water. The graves are hidden in some foliage on the back side of the hill. With the rings placed on our graves I could find my way here, and so will my husband. I know it must sound weird, but the rings acted like a compass out of the mist for me. You think it might be a problem to get my husband here? That sounds just like him… He has always been very stubborn. Tell him to meet me at our special place. He will understand what I mean. It was where he proposed to me and it was where we always went for special occasions. When my husband died in that tragic accident, I had him buried here. We always said we wanted to be buried together here when the time came. Go and give it your best try now. I hope we see you again soon. Objectives: Tell Mr Hill to go to the couple’s secret meeting place; the hill south of Applegrove. Ride back to Nilmer’s Highland and speak with Mr Hill. Everything else can wait, I’m on my way to my darling! Please ride on ahead and let her know that I am on my way. I’ll get there as fast as I can! Objectives: Ride to the grave and tell Mrs Hill that her husband is on his way. Return to Mrs Hill at their special place near Applegrove. A gravestone, in the place where I once proposed to my wife. What does it say? This is our gravestone. My darling wife… Now I understand. Rita, you have done us a huge kindness. I am sorry I resisted but I’m sure you can understand now. Now we can be together forever, precisely how it should be. I could never thank you enough for what you have done. My wife says that in the attic of our house, among her old things, there is something she would like you to have. Objectives: Look in the attic of Mr Hill’s house in Nilmer’s Highland for something Mrs Hill wanted you to have. Ride back to Nilmer’s Highland and check out the attic of the house. Meet with the Dark Core guard at the Moorland beach. There you are! So that’s the horse we’re transporting? Good. Put it in the container on the barge and tell me when it’s done so the barge can cast off. Hurry up! Get the steed on board! Objectives: Leave your horse in or in front of the Dark Core container on the barge. Go up the ramp at the end of the dock, and board the barge, then walk your horse into the indicated area near the container. Okay, the horse is in the container. Now we just need to load the rest of the stuff here… Goodbye, little girl! You’ve done your part. Get going now. Don’t stand around for nothing, girl. Away, away with you. Objectives: Get on board the barge somehow. Go around behind the containers on the beach and get inside the refrigerator that is left there. Objectives: Avoid detection and locate your horse and Justin. Moe towards the main building on the upper level. The guards follow a predictable pattern. Take your time and watch their movements to synchronize your movements so that you won’t be seen. Utilize the hiding places to remain unseen when you have to cross paths with the guards. Find a way into the Dark Core building. … I don’t understand. Justin, what do you mean this is not your horse? I don’t understand either. There must have been some sort of mixup. The only thing I know for sure is that that isn’t my horse. Nope. We noticed… And it doesn’t have the lovely, dark abilities either. Those that the witch Pi was supposed to give it. That’s just an ordinary nag. 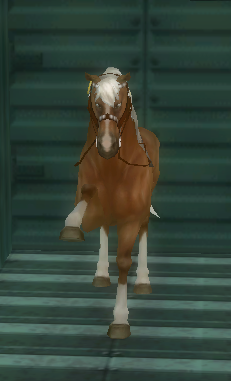 Hm… Even a little weaker than a regular horse, I would add. Is it sick? Hm… Jessica. It feels like that horse has some sort of hidden power. It’s not sick, but there’s something fishy about it. I can feel its power, but it’s not the kind we expected. This is unheard of! We put so much effort and money on that witch Pi, and then she tricks us like this and sends us… That! Wait! I don’t think Pi tricked us. She’s been a faithful servant and delivered Dark Horses several times before. You don’t let down Dark Core, you just don’t. There’s been some sort of mistake and we have to find out what it is, and fast! This doesn’t feel right. This hose feels familiar somehow. I just can’t place it. My memory is a bit hazy… I must have seen it before, but when? Calm down, Jessica, just calm down. When I scouted Silverglade, I couldn’t find a shred of evidence that they’re on the track for either Lisa or Anne. But they got to Linda, didn’t they? I couldn’t arrange her disappearance as elegantly as with Lisa and Anne. He he! One more or less. And if it wasn’t for that newcomer, Linda would still be gone. What was her name again? That horse girl who came to Moorland? Rita! Now I remember! And that horse is hers… It’s Summerblaze! It smells like… Druid? Look! Who’s that lurking behind the curtains?! I thought I felt someone’s presence anyway! That’s Rita! Get her! What do you want?! Rescue me? I don’t want to be rescued! Get out! Just get out of here, Rita! I have joined my grandfather and embraced the dark side! Just leave this place. Now! Now! Objectives: Ride to the platform where you boarded the rig and meet Captain Brus. Use the distress in the specified location on the way. Follow the arrows to escape the Dark Core headquarters. When you reach the open platform, use the distress signal, then continue down to where you boarded, and ride up onto the ship. Speak to Alex when you get back to Moorland. You’re back! Tell me about your adventure! What an adventure you’ve had! I am so impressed by your heroics and your and Summerblaze’s bravery. So Mr Sands and two of his Dark Riders live out there on the oil rig, which is the secret headquarters of Dark Core, and Justin made it clear that he didn’t want to come back. But maybe he had no choice… What else of value did we learn from this? Tell Alex everything you have learned. That’s true! We have confirmed that Dark Core is behind Lisa’s and Anne’s disappearances. We know that they want to prevent us from gathering four Soul Riders. We also know that they are trying to get four Dark Riders and they’re in a hurry. And Justin is one of their four now! We need to discuss this with Fripp and the other druids. I’ll get Linda. You can inform Elizabeth in Valedale so the meeting can get started as soon as possible. Objectives: Inform Elizabeth in Valedale. Ride to Valedale and speak with Elizabeth. I understand Rita. What horrible hardships you have experienced! What important information you have managed to find! The druid meeting needs to happen immediately. Ride up the spiral shaped path, following the sun and get the to druid meeting through the portal. Exactly the same way as last time you went there. Go up behind Elizabeth’s house, and stay on the spiral path until you get to the center of the pattern. The portal will open up and you will be transported to the Secret Stonering. You can be so dense! That Rita happens to have powers as strong as she does can only be seen as a blessing. Your bickering makes my ears hurt. She had no choice but to acquire the apple. We knew this and she succeeded. As desirable as the powers Rita has, they still need to be trained and controlled. We must prioritize her training. Right now we have important matters to discuss. Let’s review the facts one more time. Alex, please summarize the details. Of course, Fripp. We know that Justin is in Dark Core’s secret headquarters that has been built on some kind of oil drilling platform southwest of Jorvik. Rita overheard a discussion between Mr Sands, two Dark Riders, and Justin. The conversation was about, among other things, that they had been fooled by Justin’s horse, that had been intended to become a Dark Rider horse, specifically for Justin. So Justin is a Dark Rider now? Yes, we think so. Maybe not a full-fledged member yet, but he is not there against his will. He did not want to be rescued by Rita but we don’t know if he felt pressured to say that only so Rita would not get caught… Rita heard rumors that Mr Sands has manipulated Justin’s memory, so we are really not sure that Justin has chosen freely to be a Dark Rider. But? What is it that Dark Core wants to do before we do it? We don’t know what it is. Rita has already figured it out. Yes, Rita has come to the terrible conclusion that Dark Core is going to try and speed up Garnok somehow with their Dark Riders. Unfortunately it may well be possible. Our Soul Riders’ primary duty is to fight against Garnok. You can be sure that Dark Riders, being the opposite in every way to our Soul Riders, must have some connection to Garnok. Dark Core’s secret agenda has always been to strengthen Garnok and control the power to rule the world. We’ve known this for quite some time. There is nothing to indicate that this is no longer true. The lost Light Ceremony Book! Mr Sands has found the lost Light Ceremony Book! The book that describes how the Soul Riders perform the Light Ceremony to prevent Garnok. Oh no! You must be right, Linda! Can it be that Mr Sands has located the book? Now they will run the ceremony backwards to make Garnok stronger! No, we have to hope that we are in some way wrong. But my friends, be aware we cannot afford to do anything but prepare and act as though we are right. We must begin to act! We need to succeed in gathering our Soul Riders. We still don’t have any good leads on to locating Lisa and Anne. Information collected by Rita confirms that Dark Core really is behind their disappearances. Can we find more information? We also really need to get started on training for Rita so she can be a real Soul Rider. Who knows when we are going to find Lisa and Anne… We need an alternative! What more should we be doing right now? Is there anything else we can do to slow down Dark Core’s plans? We’ll finish the meeting now so we can get back to some further planning. We know for now that they are delayed until they can get a new horse for Justin. Elizabeth, you are responsible for making sure that Rita gets as much training as possible before we decide on our next course of action. We’ll see you again soon. Go in peace, druids and Soul Riders. There was a lot to discuss. All of it important. We know a lot more now than we did before… Thanks to you. And we know we need to hurry… Time is short and the darkness threatens us all in the form of Garnok. But our next move needs to be planned well. We will take the next step when we are ready for it. Now we need to plan and prepare so our next step produces the result we want. One wrong move and Dark Core might well succeed with their evil plan, if things are going as we expect. You need to increase your reputation with Aideen’s Sun Circle to at least Liked. If you haven’t already achieved the level of Liked with Aideen’s Sun Circle, it might take weeks to gain their trust and attain that level… But believe me, it is worth it! Do you understand? Elizabeth will tell you what to do next. If you are already read then we’ll just have to wait for further instructions from the council. Now we are going to take this opportunity to give you more druid training. I’m pretty sure by now you are past the beginner stage. You’ve proved that to us by now. So, I think it might be time to give you some more difficult assignments. I am going to initiate you into the secrets of the druids. Are you certain you want to join us and become a Soul Rider for the Keepers of Aideen? Are you absolutely certain that you want to follow the path of the Keepers of Aideen? Objectives: Accept if you want to follow the secret path of the Keepers of Aideen. Your mission, should you choose to accept…. In the Keepers of Aideen there are several specialties you can learn about. We call these “circles.” I am responsible for the Sun Circle. I’ll teach you all I can, but believe it or not, it will take some time. That being said, you are going to learn amazing new things and I’ll help you with your exciting future. Let’s go work on another day of blacksmithing with Conrad. Rita, this is our fifth day of working on these shoes. Listen closely to my instructions. Let’s get started! Follow Conrad’s instructions as usual. Speak with him when you are done. There we go… We are getting close to being done. Only two more days and the horseshoes will be done! Tomorrow we can continue to work with them. Tomorrow we’ll add even more power to the horseshoes… And for that we need more lapis lazuli. Listen up Rita. To strengthen the power and focus the energy of the horseshoes, we need lapis lazuli. There is lapis lazuli to collect at Nilmer’s Highlands where you have already been. Collect four more chucks of lapis lazuli and bring them back here. Here is the pickaxe you need here. Objectives: Chip off four good pieces of lazpis lazuli from Nilmer’s Highlands and bring the to Conrad. Ride up to Nilmer’s Highlands, and where the race track goes off from the road, the lapis is along the hill on that trail. The fourth piece, is farther along the trail, down by the pine trees. When you have the four pieces, return to Conrad. Those are some great pieces of lapis lazuli! They are going to work perfectly for our work with your horseshoes.